FlexTack: this is how to attach cables to curved and angled surfaces. A typical problem in the automotive industry: the integrated cable guides in the bumper are already laid down. There is only room left on the rounded and angled surfaces for additional cables for sensors. Until now, conventional rigid mounts for cable ties could not be affixed here at all, or only by using excessive layers of adhesive as a foundation. The flexible self-adhesive FlexTack mounts solve this dilemma: it sticks like a limpet, even on rounded and moderately angled surfaces. 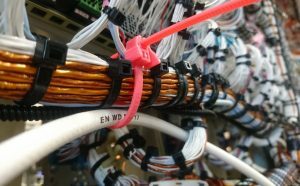 Find out in this article how to simplify your cable management on problematic surfaces and save costs with FlexTack. “One of our employees was confronted with a problem very similar to one that automotive mechanics face. He wanted to lay a cable around a small motor inside a printer,” said product manager Corinna Bünning, recalling the problem that triggered the product development of FlexTack. 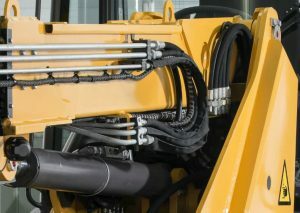 Since the rigid cable tie mount did not fit on the curved motor housing, the HellermannTyton employee simply milled hinges into a rigid plastic mount and made it flexible as a result. The idea for a flexible cable tie mount had been born. 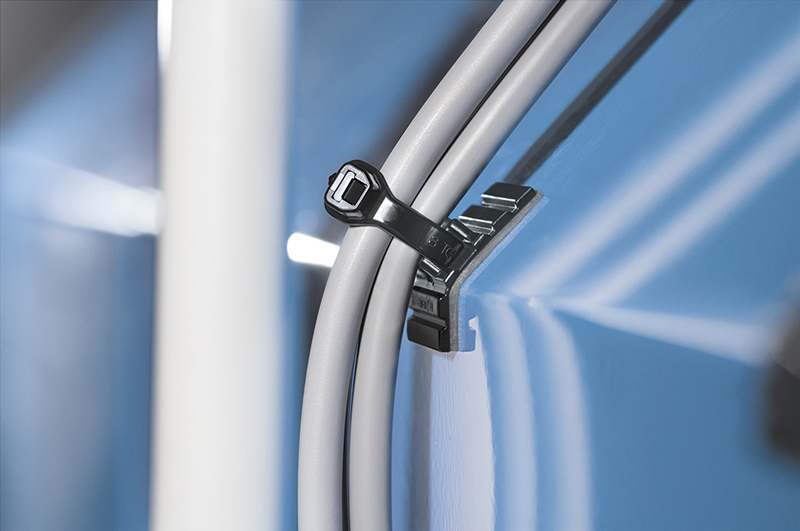 HellermannTyton engaged in further development of the innovation and launched FlexTack – a 28 x 28 mm self-adhesive cable tie mount. Thanks to its longitudinal indentations, FlexTack can be bent to match the contours of tricky surface geometries. 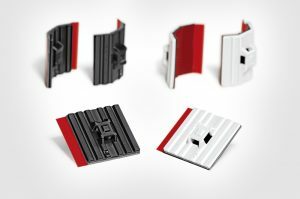 Expensive workarounds, like a rigid mount applied on thick layers of special adhesive – which also takes a long time to set, delaying installation processes – are a thing of the past. Comprehensive technical information on our FleckTack can be downloaded here: FlexTack-Series. 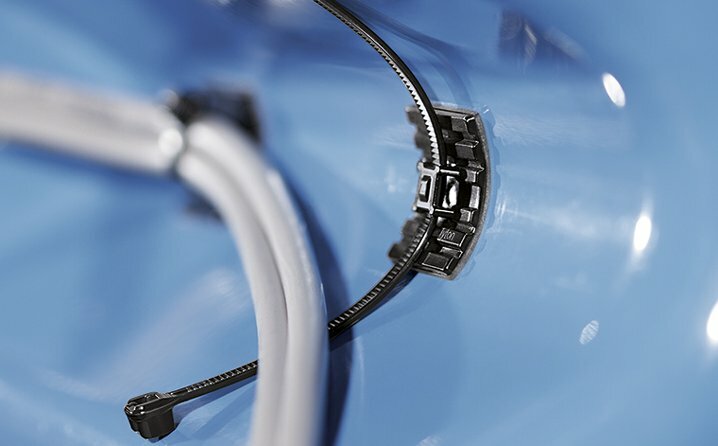 With the aid of the self-adhesive cable tie mount, mechanics can determine the best possible wiring trajectories as desired and attach the cable with a cable tie – a quick and uncomplicated process. Homogeneous tension distribution on the component is guaranteed because drilling, screwing, nailing or soldering is unnecessary. In addition, there is no damage to the surface coating and therefore no starting points for corrosion. The nerve-racking fiddling around familiar to users of many products with adhesive strips has likewise been eliminated, because the FlexTack protective film has its own finger lift tab which makes it easy to peel-off. The adhesive strip on the underside of the FlexTack mount guarantees long-lasting adhesion. HellermannTyton relies on special adhesive made from 100 percent closed cell acrylate, which has a high degree of viscosity and elasticity. Compared to standard adhesives, its tear resistance is so high, that it still holds reliably after years of use, even when exposed to temperatures fluctuating between -40 to +90° C. As a result, using it around warm machinery parts is no problem. Compared to standard adhesives, FlexTack not only adheres to high energetic surfaces like aluminium, but also to low energetic surfaces made of polypropylene, polyethylene and painted surfaces. This significantly boosts the number of application areas. Conceivable uses would be attaching cables in street lights posts or the attachment of cable along rounded surfaces in electric vehicles. Or in other industries where professional and flexible cable management is necessary: mechanical engineering, lighting manufacturers, cable assembly, shipbuilding and the railway industry, renewable energy and medical technology. FlexTack has another advantage in open installations, for example, if cables are meant to run along pipes. On the one hand, cable ties that enclose both do not look good. On the other, there are situations where attaching the cable ties properly around the pipes and cables can be laborious – for instance, when the pipe runs along a wall. In contrast, the FlexTack solution provides fitters with the freedom to lay the cables differently: either where no one can see them, or where cable ties cannot otherwise easily be attached. The product will be even more versatile in future: “We have already thought of a multitude of new applications. We are only just beginning to recognise and explore the possibilities of the product,” explained product manager Bünning. The experts at HellermannTyton are currently experimenting with other materials and sizes. Do you have any questions about the product? Then contact us via our info centre.